Miguel Cabrera’s series of casta paintings is the most celebrated of the genre, both because of his preeminence among Mexican painters of the eighteenth century and due to the vitality, inventiveness, beauty, and quality of the paintings themselves. As is traditional among casta paintings the set originally comprised sixteen canvases, long dispersed. Until now fourteen were known, eight in the Museo de América in Madrid, five in a private collection, and one in a California foundation. The present unpublished painting, is one of the missing two. 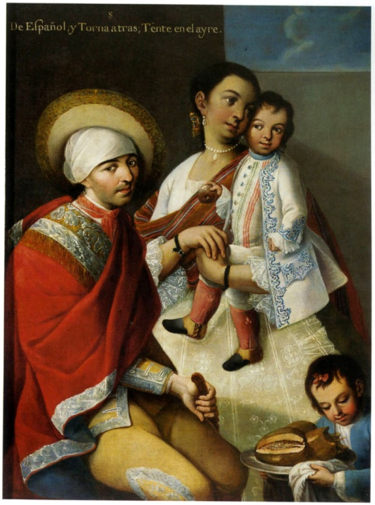 It is a discovery of great importance in the history of Spanish Colonial art. Like other works in the series, the painting is inscribed with a number (no. 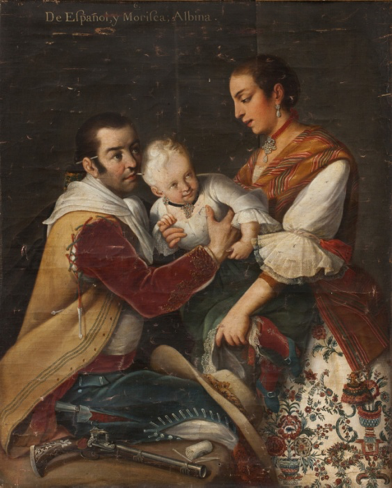 6) and an inscription identifying the protagonists -- “De Español, y Morisca; Albina”—signifying and illustrating that the progeny of a Spanish man and a Morisca (a Moorish woman, the daughter of a Spaniard and a mulatto) is an Albino child. Here the child is being passed from the richly attired and jeweled mother to the seated father. She wears a calico skirt with an elaborate floral pattern featuring bouquets in vases, wreathes, and strands of flowers (one with a bird). Over her white blouse with elaborate cuffs, tied at the elbow by a red ribbon, is a brilliant striped shawl. With a trompe l’oeil effect Cabrera dangles a flower-like tassel at the bottom, just over a fictive flower on the skirt. The father’s status is indicated not only by his dress, but by the objects that accompany him – a knife with a silver-hilt and scabbard secreted in his trousers; cigarettes, one being smoked, one in reserve behind his ear, others wrapped and scattered beside him; and a gun, a silver inlaid short blunderbuss. 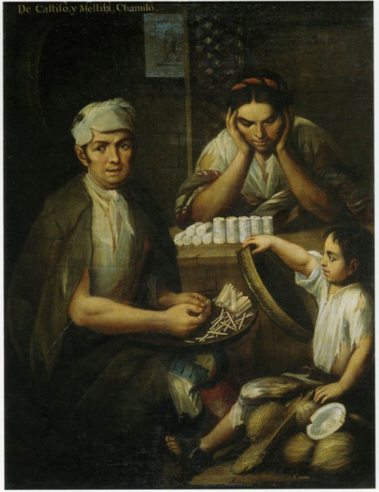 Both the individual cigarettes and the cylindrical bundle wrapped in paper with a circular imprint resemble those depicted by Cabrera in the fourteenth canvas from the series, From Castizo and Mestiza, Chamizo, now in the Museo de América, which depicts the shop of a cigarette maker and his family. The Spanish father wears a leather sleeveless coat, with what appear to be richly embroidered red suede sleeves attached to the coat with laces. His hair is braided into a queue, and the embossed container behind his head may be some sort of wrapping for it. He is a soldier, of a special group distinct from the regular army, known as soldados de cuera, or dragones de cuera, after the leather coat which they wore as protection. 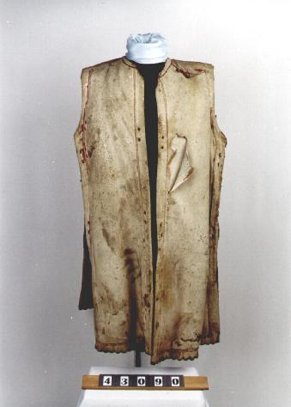 Michael Hardwick notes that the cuera worn in the painting is not the field variety, which was comprised of 7-ply deerskin leather to act as armor against arrows. Rather he suggests that this was a kind of dress uniform made of lighter leather. A surviving example of this type is in the Museo de Ejército in Madrid (see illustration). The gun beside him is a short flintlock blunderbuss, sometimes called a dragon or trabuco. Hardwick notes that the silver inlay is in Catalan style and believes the pistol most likely originated in the Spanish town of Ripoll, celebrated for its production of firearms. It features a Miquelet action lock, with flint depicted in place. A weapon similar to that in the painting and dated ca. 1774, is illustrated below. Hardwick also identifies the sheathed knife as a belduque, or belt knife. A similar Spanish Colonial example is illustrated. Both the mother and daughter wear elaborate jewelry. The mother has a necklace of clustered clear stones or pearls held by a ribboned choker, with matching earrings. The child similarly sports clusters of stones in both necklace and earring. These appear to be coral and turquoise – a kind of luxury amulet. The painting is in a remarkable state of preservation. It is unlined and unstretched and was painted to be presented in the manner in which it is now seen – as a scroll, with a hanging bar fashioned with a cove molding that runs along the top edge of the canvas. The bottom edge is affixed to a roller, capped with finials at either end. Both the bar and roller are made of wood, the bar gilt and polychromed with a floral decoration on a green field, the rod of the roller painted green with gilt-tipped, red painted finials. When closed for transport or storage, the roller, with the canvas wrapped around it, nestles into the cove of the top bar. Presumably this was originally kept in a scrolling case, perhaps one that could accommodate the entire set of sixteen works. The hand-made nails with which the canvas is attached to the wood mount and scroll are original. There is a thin unpainted border along the left and right edges of the canvas, which may have originally been covered by a ribbon. This original scroll format is lost on every other example of Cabrera’s casta series – all of which has been attached to stretchers and framed, as in the example below left. Two of the paintings in the series (nos. 1 and 7) retained their identical scroll format as recently as 1980, but have since been altered to traditional stretcher supports. The present painting has long been in the collection of a California family. It was given to James R. H. Wagner in the 1920s by David Gray, a friend and neighbor in Montecito. Gray had been the President of the Ford Motor Company and left the company with a $26.5 million payment for his stock interests in 1919. The same year Gray began work on a Spanish-style mansion in Montecito christened “Graholm.” Gray and his wife traveled to Europe to acquire furnishings for his new home: “As the house neared completion the Grays embarked on a shopping expedition to Europe. They returned with a treasure-trove of antiques and objets d’art to furnish their new residence.” It was in Spain, according to family tradition, that Gray acquired the casta painting, but the specific date and circumstances of its gift to Wagner are not recorded. In 1926 Wagner, a real estate executive, arts philanthropist, and President of the Rose Bowl, moved into a new home in Montecito designed by George Washington Smith and it may have been at this time that the painting was given to him. 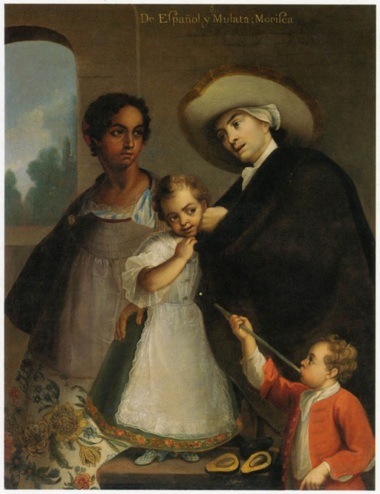 Wagner’s daughter Harriet and son-in-law Gregory Jones inherited the painting and installed it in the historic Vallejo-Casteñada Adobe in Sonoma, which they purchased in 1947, meticulously restored, and named “La Casita.” The painting appears in family photographs taken in the house in the 1950s and 60s (see below). The painting has since descended to the granddaughter of the Jones’s. 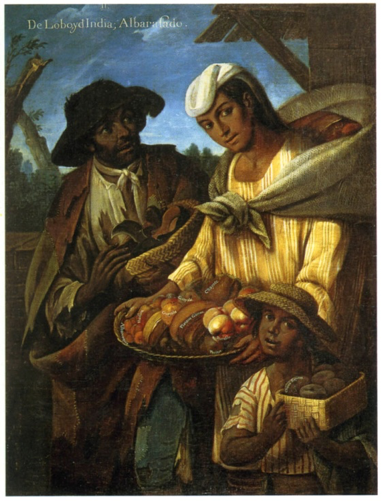 Maria Concepcion Garcia Saiz, “Pinturas costumbristas del Mexicano Miguel Cabrera,” Goya 142 (Jan-Feb 1978), pp. 186-193. 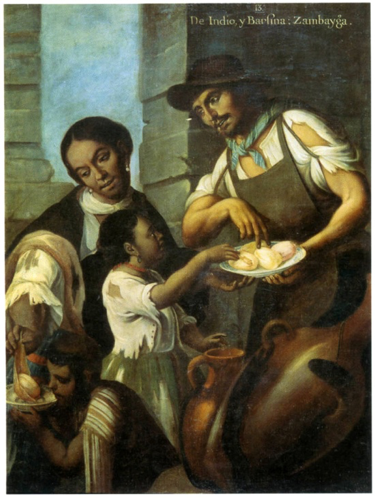 Teresa Castello Yturbide, “Los cuadros de mestizaje y sus pintores,” in Antonio Pompa y Pompa, et. al., De la istoria: homenaje a Jorge Gurría Lacroix (Mexico City 1980), pp. 30-45. Efraín Castro Morales, “Los cuadros de castas de la Nueva España,” Jahrbuch für Geschichte von Staat, Wirtschaft und Gesellschaft Latinamericas, 20 (1983), pp. 671-688. Maria Concepcion Garcia Saiz, Las castas mexicanas: un género pictorico americano (Mexico City 1989), pp. 80-87. Elena Isabel Estrada de Gerlero, “Las pinturas de castas, imágenes de una sociedad variopinta,” in Mexico en el Mundo de las Colecciones de Arte; Nueva España, (Mexico City 1994) II pp. 86-88. Guillermo Tovar de Teresa, Miguel Cabrera: drawing room painter of the heavenly queen (Mexico City 1995), pp. 239-248, 355-357. Ilona Katzew, ed., New World Orders: Casta Painting and Colonial Latin America, exh cat. New York 1996, pp. 8-29. 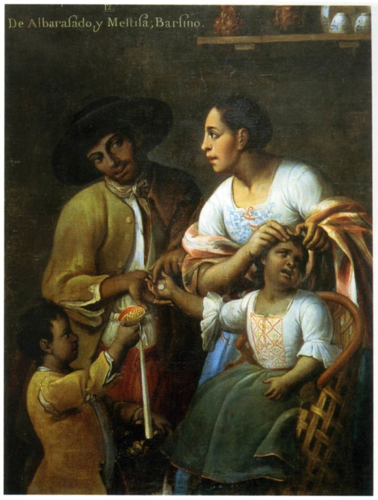 Magali M. Carera, Imagining Identity in New Spain: Race, Lineage, and the Colonial Body in Portraiture and Casta Paintings. Austin 2003, pp. 27-30, 69-83. Maria Concepcion Garcia Saiz, in The Arts in Latin America; 1492-1820, ed. Joseph J. Rishel with Suzanne Stratton-Pruitt, exh. cat. Philadelphia Museum of Art; Antiguo Colegio de San Ildefonso, Mexico City; Los Angeles County Museum of Art, 2006-2007, pp. 402-409. I am grateful to Michael Hardwick for sharing his knowledge of material culture of the Spanish Colonial period. He compares the dress of the man in the painting to that worn by the kneeling soldiers at the left in Mariano Guerrero’s Fray Junípero Serra recibe el viático of 1785, Museo Nacional de Historia, INAH-CONACULTA. As illustrated in Marc Simmons and Frank Turley, Southwestern colonial ironwork : the Spanish blacksmithing tradition from Texas to California, Santa Fe 1980. These two paintings were described as “Ethnographical Portrait Groups” by Cabrera when sold as one lot (no. 207) at Christie’s, New York, May 7, 1980, for $46,000. Hattie Beresford, “Moguls and Mansions; David Gray,” Montecito Journal (Winter Spring 2012-2013), pp. 76.